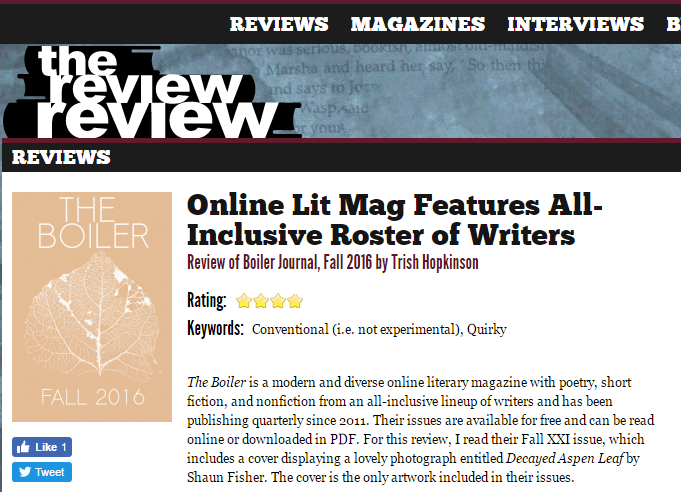 My review of The Boiler’s Fall 2016 issue just went up on The Review Review! Just last year I sent a request to join the ranks of the literary reviewers on their site and this is the fourth lit mag they’ve asked me to read and write about. The first two were print issues, meaning, not only did it give me motivation to read a new lit mag from cover to cover, but I received them for no cost! Interviews with a variety of editors, writers, etc. – what a foolish plan to shoot to miss. I enjoyed the prose as well—wonderfully worded with well-developed characters and believability within a range of topics. I found Linda Boroff’s short fiction piece relatable and realistic; it reads more like creative nonfiction than fiction to me. I particularly liked the imagery she used and quickly found myself immersed in the story. The Boiler is currently open for submissions. Their deadline is coming up quick. They read quarterly and you can view upcoming deadlines on their submissions guidelines page. Click here to submit to The Boiler.